He was educated on 17 October 1564 at Shrewsbury School, Shrewsbury, Shropshire, EnglandG.3 He matriculated at Jesus College, Cambridge University, Cambridge, Cambridgeshire, EnglandG, on 20 May 1568.3 He held the office of Gentleman of the Privy Chamber in 1581.3 He held the office of Clerk of the Signet to the Council of Wales in 1581.3 He held the office of Secretary for Wales on 20 April 1585.3 He graduated from Oxford University, Oxford, Oxfordshire, EnglandG, on 11 April 1588 with a Master of Arts (M.A. )3 He held the office of Ranger of Wedgnock Park in 1597, and he obtained this estate from the Queen in 1601.3 He gained the rank of Rear-Admiral of the Fleet in 1599.3 He held the office of Secretary to the Council of Wales in 1603.3 He was appointed Knight, Order of the Bath (K.B.) on 24 July 1603.3 In 1604 he received a grant of Warwick Castle, which was in a ruinous state.1 He succeeded as the 5th Lord Willoughby de Broke in 1606. He adopted Robert Greville, 2nd Baron Brooke of Beauchamps Court circa 1611.4 He held the office of Chancellor of the Exchequer between 1614 and 1621.1 He was appointed Privy Counsellor (P.C.) on 1 October 1614.1 He was Joint Commissioner to treat with Holland in 1619.1 He held the office of Member of Parliament (M.P.) for Warwickshire from 1620 to 1621.1 He was created 1st Baron Brooke of Beauchamps Court, co. Warwick [England] on 29 January 1620/21, with a special remainder to Robert and William Greville.3 He held the office of Gentleman of the Bedchamber in October 1621.1 He held the office of Recorder of Warwick.1 He held the office of Member of the Council of War.1 His last will was dated 18 February 1627/28. [S6] G.E. Cokayne; with Vicary Gibbs, H.A. Doubleday, Geoffrey H. White, Duncan Warrand and Lord Howard de Walden, editors, The Complete Peerage of England, Scotland, Ireland, Great Britain and the United Kingdom, Extant, Extinct or Dormant, new ed., 13 volumes in 14 (1910-1959; reprint in 6 volumes, Gloucester, U.K.: Alan Sutton Publishing, 2000), volume II, page 331. Hereinafter cited as The Complete Peerage. [S6] Cokayne, and others, The Complete Peerage, volume II, page 332. [S6] Cokayne, and others, The Complete Peerage, volume II, page 333. Margaret Greville, Baroness Willoughby de Broke was born circa 1561.1 She was the daughter of Sir Fulke Greville, 4th Lord Willoughby de Broke and Lady Anne Neville. She married Sir Richard Verney on 29 October 1582 at Alcester, Warwickshire, EnglandG.1 She died on 26 March 1631. [S6] G.E. Cokayne; with Vicary Gibbs, H.A. Doubleday, Geoffrey H. White, Duncan Warrand and Lord Howard de Walden, editors, The Complete Peerage of England, Scotland, Ireland, Great Britain and the United Kingdom, Extant, Extinct or Dormant, new ed., 13 volumes in 14 (1910-1959; reprint in 6 volumes, Gloucester, U.K.: Alan Sutton Publishing, 2000), volume XII/2, page 691. Hereinafter cited as The Complete Peerage. Sir Richard Verney married Margaret Greville, Baroness Willoughby de Broke, daughter of Sir Fulke Greville, 4th Lord Willoughby de Broke and Lady Anne Neville, on 29 October 1582 at Alcester, Warwickshire, EnglandG.1 He died on 7 August 1630. 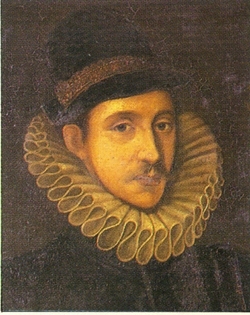 Greville Verney, 7th Baron Willoughby de Broke was born circa 1586.1 He was the son of Sir Richard Verney and Margaret Greville, Baroness Willoughby de Broke. He married Catherine Southwell, daughter of Sir Richard Southwell, on 13 May 1618. He died on 12 May 1642. He gained the title of 7th Baron Willoughby de Broke. Catherine Southwell was the daughter of Sir Richard Southwell. She married Greville Verney, 7th Baron Willoughby de Broke, son of Sir Richard Verney and Margaret Greville, Baroness Willoughby de Broke, on 13 May 1618. Greville Verney, 8th Baron Willoughby de Broke was the son of Greville Verney, 7th Baron Willoughby de Broke and Catherine Southwell. He died on 9 December 1648. He gained the title of 8th Baron Willoughby de Broke. Elizabeth Wenman is the daughter of Richard Wenman, 1st Viscount Wenman. Thomas Wenman, 2nd Viscount Wenman was born in 1596. He was the son of Richard Wenman, 1st Viscount Wenman and Agnes Fermor.1,2 He married Margaret Hampden, daughter of Edmund Hampden.3 He died on 25 January 1664. He gained the title of 2nd Viscount Wenman. [S15] George Edward Cokayne, editor, The Complete Baronetage, 5 volumes (no date (c. 1900); reprint, Gloucester, U.K.: Alan Sutton Publishing, 1983), volume II, page 93. Hereinafter cited as The Complete Baronetage. Greville Verney, 9th Baron Willoughby de Broke was born circa 1648. He was the son of Greville Verney, 8th Baron Willoughby de Broke and Elizabeth Wenman. He married Lady Diana Russell, daughter of William Russell, 1st Duke of Bedford and Lady Anne Carr, on 29 August 1667.1 He died on 23 July 1668. He gained the title of 9th Baron Willoughby de Broke.